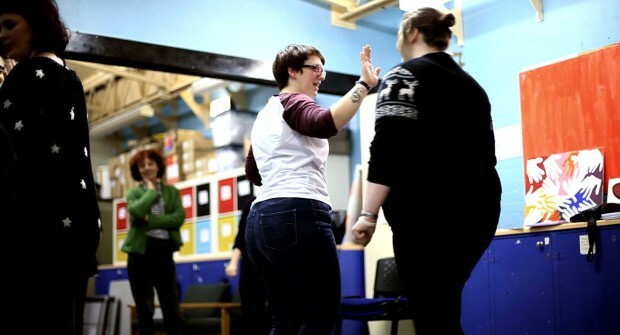 This ethics guide from the Centre for Social Justice and Community Action at the University of Durham shows how forum theatre can be used as a means to explore ethical issues in a workshop scenario. Forum theatre, developed by Brazilian director Augusto Boal, allows actors (participants in the workshop) to act-out how participants of community based participatory research (CBPR) feel. This allows the actors to feel similar emotions to participants and gain a wider understanding of ethical problems. The audience will be interactive, pausing the actors at different points, asking them to act-out different strategies to solve ethical concerns that come up through the theatre performances. Additionally, the guide also describes other ‘games’ participants in the workshop could also play to allow them to see these ethical problems from different perspectives. Caption: Image from Performing ethics: Using participatory theatre to explore ethical issues in CBPR produced by the Centre for Social Justice and Community Action at the University of Durham. Download the performing ethics guide here.